For those unaware, the story takes its first steps as a community tonight. 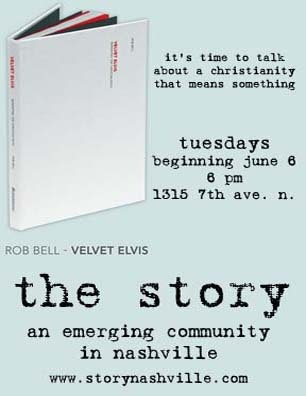 We begin with a discussion of Rob Bell's book, Velvet Elvis, tonight at our place at 6 PM. We'll be discussing the book on Tuesday nights in June and July, so if you have to miss once or twice, don't worry. For other details and some background info, check out the story website.